Located in North Myrtle Beach, Possum Trot is of the first ten golf courses in Myrtle Beach to be built. As a classic Russell Breeden design, it‘s known as the most amiable of all Myrtle Beach golf courses. Locals and tourists alike agree that Possum Trot rolls out the red carpet, making all guests feel like VIP’s and lives up to the name as “Friendliest Course on the Strand”. The course is home to a world-class golf academy and one of Myrtle Beach’s top three golf practice facilities. Possum Trot is housed by the Glens Golf Group, a group that encompasses a number of elite courses such as Glen Dornoch, Shaftesbury Glen and Heather Glen. Wide-open fairways, access to a complete golf training center, and memorable par -5s make Possum Trot a favorite addition to golf vacation packages, no matter the handicap. 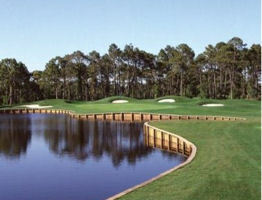 No doubt- this golf course in Myrtle Beach offers a variety of shot opportunities and challenges for all skill levels. The straightforward design with tree-lined fairways, ponds, rolling terrain, and bunkers adjoining large undulating greens are a few golfing challenges. Tee-shot accuracy is required at the 7th-hole. Although the 7th-hole is a short distance (340 yard par 4), it presents golfers with many challenges and is nicknamed “Pesky”. Do you desire to successfully play through this hole? Use a 3 wood and not a driver. The other holes will require strategy as you plan your layup and the approach over the water. Each hole at Possum Trot offers an experience like no other, right down to naming the holes. Ham it up with your golf buddies at “T’aint Easy”, “Little Possum”, “Analysis is Paralysis”, and “Big Possum”. “Oh, No” #18 is Possum Trot’s finishing hole and has a close view of the fountain pond and clubhouse. Long hitters beware…you will have to play an uphill fairway and work against the ocean breeze to get on in two. Possum Trot is a perfect addition to any golf vacation. Golf Digest listed it as “Places to Play” with a 3.5 star rating, “Best On-Course Practice Facility in Myrtle Beach”, and “Most Underrated Golf Course in Myrtle Beach”. The course also has a premium pro shop that is fully stocked with all name brand golf essentials and one-of-a-kind Possum Trot logo apparel. Golf packages are available. Discount golf is usually available when booking golf tee times early. Golf at Myrtle Beach! I LOVE THIS COURSE! Course is in great shape and staff is very attentive and professional. I would play here all the time if I didn't live 500 miles away. It's a shame if it closes in September, 2019. What a nice place to spend an afternoon driving golf balls! The grounds are well kept and the buckets of balls reasonably priced. We will definitely return. I have not played the course, this rating is for the practice facility only. I only visited and went to the range. Possum Trot has a very good practice facility. A medium bucket is $7 and is all grass tees. There is a chipping area and a putting green. They even have some bunkers that you can hit out of. Good course layout. Good condition for this time of year. Sorry they are closing end of September. This a great course that will be missed when it closes. Great greens and very challenging holes. Possum Trot is a great place to play some challenging golf. It's also quite and has a really nice layout. In my opinion, the golf course overall is pristine. The layout is very challenging. It's quite when playing the course which is something I enjoy. The maintenance staff is courteous on the course. Possum Trot is a pleasure to play. I just know I always play well there. The course is well maintained and great staff inside and outside. I can play there every week. I really enjoy this golf course, well maintained and the staff is very friendly. FANTASTIC..Course was in great shape. May have to return. On Wednesday. Not a good experience for our group. Initially we were greeted by a rude gruff starter. Obviously they were not interested in making a good first impression. Thinking perhaps I was being a bit hyper-critical, I asked my playing partners what their impression was and it was the same as mine. There are too many other golfing options in the Grand Strand area to have to put up with folks who don't appreciate you or don't realize you are the reason they are getting paid. Anyway, we won't visit again. Course was in decent shape, it was what we were expecting as far as quality. The on course bathrooms were very dirty and gross. Haven't been cleaned in a lonnnngg time. Spider webs/eggs everywhere. This place just needs someone to pay a little attention and take care of the small details and that could have a big impact on its continued longevity. Golf course was in good shape. Nice course for the novice golfer. However, because we we re e playing a little slower due to a couple bad holes, the staff felt it was beat to harass us rather than let a faster group play through. A couple of the staff yelled at us as we passed from the 9th to the 10th hole, and it felt as though the Marshall followed us around. He even sat and watched as we played in new hole. Understand the need to keep pace, but there is a better way to go about doing it. I was very satisfied with this course. This week has been soggy for golf with all the daily down poors, and this course had some of these challenges as well. Not as bad as some others though. The tees and fairways were in good repair; most of the greens were fine and seemed to have begun their recovery. Some still have a ways to go. I liked the layout of the course and it had a decent but manageable challenge to it. The pace of play was good. The staff were all friendly and helpful. The price was good for the conditions. I definitely recommend this course and intend to come back again someday. Excellent course for all golfers of any skill level. Great greens of average speed excellent fairways and tees. Has some challenging holes but worth the attempt to defeat. Reasonable pricing and good staff. As a family we've traveled to MB almost every summer for since I can remember. NEVER have we seen greens in such bad shape. I realize that they are recovering from a rough winter and many other courses have had the same issues. However, the others have had the common courtesy to close until their courses can recover to the MB quality that golfers come to expect from this golfing heaven. The greens were so bad that they were legitimately not fair to play golf on. The course itself was very loosely cared for and sloppy. Many of the sand traps we're filled with water. The pictures that I attached are worst case scenarios, but are still relative to what you would find on most holes. I would not advise playing this course for at least 1 month after this review was written. Even still, it's become one of the lower-tier courses in the area. I played it 2 years ago and it was in much better shape and was kept much nicer. At least it was relatively inexpensive. Located in North Myrtle Beach, Possum Trot is of the first ten golf courses in Myrtle Beach to be built.